As a young girl, Margareth Divers (’12, Haiti) saw women from her community, Musseau, laden down by fruits and vegetables as they made their way towards the marketplace. Their children trailed along behind, perhaps glancing longingly at the school building as they walked by. These children might have been Margareth´s classmates had they not needed to help transport and sell produce day after day. Now, poised to graduate from EARTH University, Margareth is brimming with ideas to help improve the lives of these small producers and their families in Haiti. 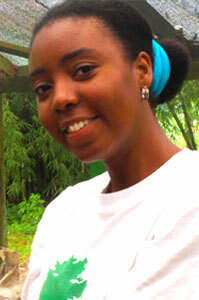 In 2011, instead of travelling to a new country for her internship, Margareth ‘returned to Haiti. There, she worked alongside laborers on a vegetable farm in Mangnan Basin in Gonaïves. She was curious to see how agricultural workers were handling production and the methods they were using. While working on the farm was valuable, what Margareth enjoyed most was her volunteer service in the community. On Saturdays, those interested would gather to hear her share information about running a small business. It was during this experience that Margareth learned that the farmers there do not know how to make their own fertilizer, and instead spend almost 40 percent of their income on agricultural chemicals. Margareth also realizes that while the farmers in Haiti grow a lot of vegetables, the produce seldom meets the required conditions for supermarkets to sell. As a result a lot of produce is lost. Without understanding what steps to take postharvest, the produce does not last long enough to even make it to the supermarket. “They can harvest lettuce today at five in the morning, and already by two in the afternoon the lettuce has gone to waste,” says Margareth.